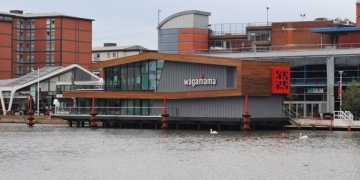 Rapidly expanding national restaurant chain, Wagamamas, recently opened a new venue on the Brayford Pool in Lincoln in a landmark building on the site of the old harbour masters office. The building uses cedar cladding, supplied by Bennetts Timber, as part of it's external facade giving it a stunning contemporary feel contrasting with the dark grey and red of the steel, large areas of glass and the surrounding water. The building was constructed by the Lindum Group, a large construction company also based in Lincoln, with whom we have a close working relationship as a supplier of timber products. This represents a major investment in Lincoln and compliments the regeneration of the University Quarter/Brayord Pool over the past few years. We are pleased to have been involved in this high profile project which shows how timber cladding is the material of choice for economic, aesthetic and sustainable reasons.